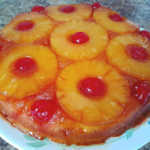 As the name says, pineapple upside-down cake is turned upside-down once it is ready. Doing this is very simple. All you have to do is start by arranging the pineapples at the bottom of the baking pan and then pour the cake batter over it. Preheat your oven to 350 F (177 C). Now put the melted butter and brown sugar in a mixing bowl. Whisk until a smooth and silky mixture forms. Place it into the bottom of a 9-inch cake pan and smooth it out evenly using a spatula. Place the pineapple rings over it and the cherries into the center of the rings. Put the softened butter and white sugar into a separate mixing bowl and whisk them together. Add in the eggs and whisk. Pour in pineapple juice and whisk until combined. Sift in the flour, baking powder and salt. Whisk once again until well combined and the batter is lump free. You can use electric mixer if you like. Pour the batter over the pineapple rings and smooth it out with a spatula. Place it on a baking tray. Using a sharp knife cut around the edges of the cake pan to ensure it doesn’t stick. Place a plate over the top and flip it over. Give it a few taps and remove the cake pan.